The Zray A2 Paddle Board gives you all the expertise of one of the leading inflatable stand-up paddle (iSUP) manufacturers. Some people may be wary of iSUPS, and consider them to be inferior to standard paddle boards. If well-constructed, like the Zray A2, iSUPS can be high-quality boards with excellent maneuverability. 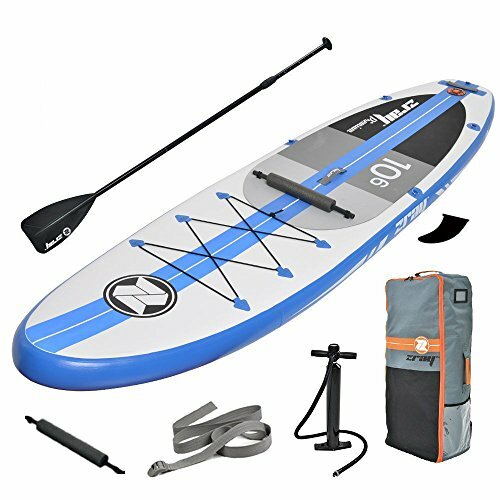 This lightweight Zray paddleboard comes with all the accessories you need, so you can enjoy the water without looking for your own gear. There’s a hand pump so you can grab the paddleboard from your backpack and have it inflated and working in no time, a footrest, backpack, closure belt and paddle. The inflated board measures 10’6″ x 32″ x 6″ after inflation, but weighs 23 pounds. There’s a traction pad to keep your footing steady, and nine D rings so you can attach a backrest, kayak seat or other items. The Zray A2 Paddle Board has everything you need in one compact package. An iSUP without accessories or built-in advantages isn’t of much use to any paddle board enthusiast, and the people at Zray know that. The board comes with three fins (two of them fixed), and the center fin is removable. Removing the fin makes packing the board easier, but it also lets your children use the board for playing in the ocean or a large swimming pool. The grey and white striped EVA pad offers traction so anyone, even novices, can handle the board better. Use the hand pump that comes with the board to inflate it. It’s best filled at a 10-15 PSI, though most users prefer the 15 PSI. The full paddleboard provides a rigid surface to stand on, and the 10.6-foot length and 32-inch width give most users enough space to balance and maneuver. There’s a center carry handle to make transporting the paddle board easier on your hands. The paddle board is constructed to accept either a kayak seat or backrest, so you’re not stuck with one or the other. You can adjust the aluminum paddle, which offers deft maneuvering at any length. The paddle adjusts in three sections, from a minimum of 65 inches to a maximum of 85 inches. It’s part of the package, but it is stiff enough to last as long as the paddle board. The stylish backpack is more than an afterthought. Made of durable material, it keeps the deflated paddle board safe and looks good while doing it. The professional central fin is large enough to mimic more expensive, non-inflatable boards. There’s one Z-shaped air valve at the front of the board to quickly fill it up and get ready to ride the waves. The outside of the board has a double layer of fabric with cotton inside for extra comfort. The materials used to construct the Zray A2 Paddle Board virtually guarantee it will sustain heavy use without bending. Inflatable boards made of thinner material may bend or warp, but the high-quality contents of this board will give you years of service. The patented, scratch resistant, drop-stitched design uses 500 denier PVC for superior strength. Three layers of laminated material comprised of polyester mesh and heavy-duty PVC offer a firm foundation for your weight. The 150mm thick, inflated drop-stitch chamber allows you to pump it up using a top rate of 15 PSI. The outside tarpaulin is made of mesh PVC cloth to stay sturdy regardless of water currents or intense rides. Two types of seam tapes are used – 500D 18 by 20 PVC Core Rail Seam Tape and 500D 18 by 20 PVC Extra Reinforcement Tape. The Grooving Water Traction EVA non-slip footpad completes the durable, scratch-resistant construction. Of course, nothing is 100% accident resistant, but this paddleboard comes pretty close. You’d need to get a rough situation to do real damage to this board. Some manufacturers use glue to piece boards together. Even though adhesives used for this purpose are quite strong, they can’t assure you of the safety and durability of the Zray A2’s drop-stitch design. At six inches thick, the paddle board is two inches deeper than most iSUPs, for extra protection. This depth gives you a better chance of avoiding accidents, rips, and tears or wearing out the board. The solid core provides enough reinforcement to keep you in the water all day without scratches or punctures. The board has stainless steel D-rings to secure all types of cargo, a safety leash or kayak seat. These rings allow you to bring all the supplies you need and keep them attached through your ride. The sturdy rings will keep items connected even when conditions are challenging. The D-ring distribution consists of four rings on the nose, secured with a bungee cord, four rings in the center for a backrest or kayak seat, and one D-ring on the tail to attach a safety leash. The design encourages stability and lets you stay balanced without struggling. The broad surface lets you move around with slipping or falling in the water. With a weight limit of 320 pounds, anyone can use it, whether they’re college-age or middle-aged. The durable PVC, drop-stitched material can handle a combination of rough waters and fancy footwork from boarders of all skill levels. Easy to transport – This inflatable board can be easily stored. Roll it up and stash it in your backpack for quick transport. Sturdy – The double layer outer skin is made with rigid, drop-stitched material that’s resistant to scratches, dings, and dents. 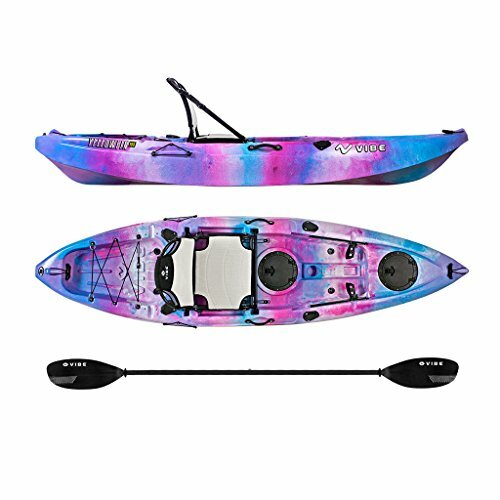 Accessories included – This Zray A2 iSUP Paddle Board comes with a footrest, backpack, hand pump, gauge, and closing belt to keep the deflated paddle secured in the backpack. The aluminum paddle adjusts from 65 to 85 inches to accommodate your needs. Tri-fin navigation – This inflatable board has a tri-fin navigation system so it can work as smoothly as big tails. Bungee cord – D-rings linked with a bungee cord make it easy for you to store camera, shoes or even a kayak seat. Stable – This extra-wide Zray board holds up to 320 pounds. Non-slip pad – The EVA traction pad prevents slip and accidents even in rough waters. 1-year warranty – The Zray’s warranty covers materials. The Zray A2 Paddle Board has all the features you could want in an inflatable board. But how do customers rank it? Most Amazon reviewers like how smoothly the Zray Paddle Board operates, and they use it again and again. Reviewers like the durability of the Zray Paddle Board, and like the military-grade PVC material that gives the iSUP the sturdy feel of a traditional board. Although the paddleboard comes with a high-pressure hand pump, users recommend getting your electric pump to inflate the board faster. The paddle, backpack and other accessories are high-grade, although some users prefer to bring another backpack for storage. Novice paddlers will appreciate the accessories. People with more experience might look at the extras as unneeded. Customers like the A2’s toughness. The industrial hand stitching allows this board to withstand lots of punishment, so don’t be afraid to ride it in rough water. The gripping pad covers over half the board surface. This extra padding will help improve your grip, and beginners especially like it. The iSUP paddleboard is easy to maneuver. It’s 32 inches wide so that you can retain balance better than on a slimmer board. The Zray A2 Paddle Board offers everything you could want in an iSUP. It’s sturdy and is big enough to accommodate just about anyone. This paddleboard is safe enough for you to take your child or spouse on a ride with you, even if they’re not used to riding a board. 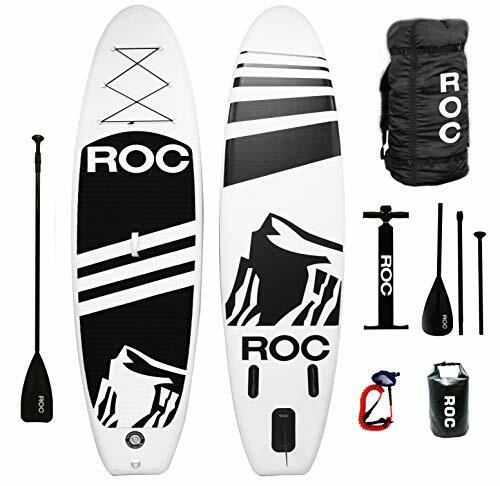 The accessories and all the D-rings for attaching items make this the ideal paddle board to give as a gift for new enthusiasts. New users will have everything they need and can hit the water as soon as they receive their board. It may not be sophisticated enough for experienced paddle boarders, but the Zray A2 Paddle Board has all the features for beginners and enough to keep intermediate boarders challenged. Durable and all-inclusive, the Zray A2 Paddle Board provides the reliability of a traditional board in an iSUP version. You can use this board with confidence for fun and tours anywhere.